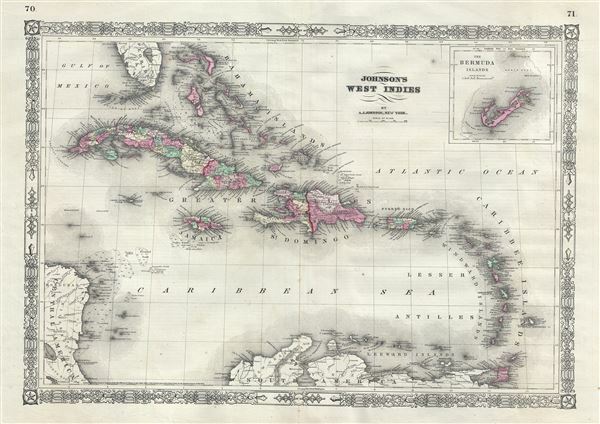 This is a beautiful example of A. J. Johnson's 1866 map of the West Indies. It covers from Florida to Venezuela and from Honduras to Barbados. Includes the Bahamas, Cuba, Jamaica, Santo Domingo (Hispaniola), Porto Rico, and the Lesser Antilles or Windward Isles. An inset of Bermuda appears in the upper right quadrant. Features some offshore detail with depth soundings in the Pedro Bank off Jamaica, off the coast of Nicaragua, and in the Bahama Bank. Larger islands feature color coding according to district. Throughout, Johnson identifies various cities, towns, rivers and assortment of additional topographical details. Features the fretwork style border common to Johnson's atlas work from 1864 to 1869. Published by A. J. Johnson as plate numbers 70 and 71 in the 1866 edition of Johnson's New Illustrated Family Atlas. Very good. Minor wear and verso repair along original centerfold. Minor foxing at places. Text on verso.